Steve Simon, Fifth Group Partner, and their Midtown dumpster-free restaurant was featured in a front-page article in the NY Times. Instrumental to the ZWZ success, Jon Johnston with the EPA was quoted through out the article. The impressive GFA mention has generated much enthusiasm from across the nation. WXAI recently aired two stories featuring ZWZ~Buckhead Participant Buckhead Diner and Greenco Environmental, the only food composting permitted facility in Georgia. Marc Pickard is a strong ZWZ enthusiast and we appreciate his positive stories about how the foodservice industry is changing standard operating practices. The Atlanta Business Chronicle ran an excellent article on Greenco and featured many of the ZWZ Participants, including the Doubletree Hotel Atlanta ~ Buckhead, Affairs to Remember and Fifth Group Restaurants. Stay tuned in as the great media coverage is just beginning! The Georgia Recycling Coalition will direct the recycling efforts to make sure the EXPO will recycle as much as possible towards Zero Waste. The Sustainability Division of the DNR will conduct a case study to verify and record the recycling and composting of the EXPO. Greenco will provide the services and guidance to make sure all food scraps from the Food Court, Chef’s Corner, and Eco-Reception will be composted. The Department of Community Affairs will be onsite to help educate the attendees on the initiatives and assets available for recycling in Georgia. City Of Atlanta will provide the Special Events Recycling Trailer to assist with the EXPO recycling. Check out a 3 minute video on these trailers and the press release. VERUS CARBON NUETRAL will measure the carbon footprint of Enviro Expo USA and will offset the imprint with Georgia assets. Wow ~ both a Zero Waste AND a carbon neutral event!!! Be sure to attend the EXPO on November 14 & 15 at the Georgia World Congress Center. How fun to welcome over thirty restaurateurs, foodservice operators, property managers and concerned residents to ecco for the ZWZ~Midtown launch. It was standing room only! The zone is a Midtown Alliance project in partnership with the GFA. Thank you to Kathy Meyers & Brian Smith of the Midtown Alliance for making the launch a big success. Susan Mendheim, Midtown Alliance President & CEO, welcomed the crowd and expressed the importance of the zero waste initiative. The Sustainability Division of the GA DNR, Greenco Environmental and the GFA followed with presentations on zone criteria and how to implement criteria. 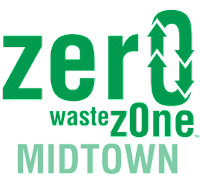 Steve Simon, Zone Champion & Partner with Fifth Group Restaurants, inspired Midtown businesses on the ease and importance of joining Zero Waste Zone efforts. Joe McCarthy of Waterhaven joined the morning of the launch and was recognized as a founding participant along with ecco, South City Kitchen, Veni Vidi Vici and The Fox Theatre. Veni Vidi Vici sent in their ZWZ Pledge in July, long before the ZWZ-Midtown was in the planning stage ~ the Buckhead Life Group management team are visionaries! Atlantic Center Plaza sent in the first pledge after the launch and is the first multi-use building to formally join a ZWZ ~ we appreciate Colonial Properties Trust serving as pioneer. Stay tuned for the non-foodservice impact of the ZWZ-Midtown. Thanks to Steve Simon’s generosity the crowd enjoyed wonderful cuisine and adult (!) beverages after the zone launch. Ecco staff gave tours of their dumpster-free restaurant and many enjoyed the Midtown patio until sunset. Did I hear the rumblings of a friendly competition among Atlanta’s ZWZs? Hmmm … it looks like Midtown is going to keep Downtown Atlanta, Buckhead and Off-Premises Caterers on their toes! Watch out when ZWZ-Perimeter launches: Elisaveta Dimova of the Crown Plaza Ravinia embodies a true competitive spirit and is the inspiration for the Perimeter Atlanta Zone. Last week Holly gave a ZWZ presentation to the Department of Natural Resources Board of Directors and included impressive composting stats from several ZWZ participants. Only considering the below ZWZ Participants, in September 152 tons of food residuals went to Greenco for composting instead of a landfill. Thanks to the GA Department of Community Affairs, the ZWZ has access to an impressive tracking system. In the next several months we can report the amount of recycling and composting submitted by zone participants. Another benefit of tracking the amount of recoverable products (glass, paper, plastic & metals) and perishable organics (food residuals, waxed cardboard, parchment paper, paper towels and others) recycled or composted is the focus on the disposal stream. Why is so much product “thrown away”? Was it necessary to purchase so much? Note FreshPoint is a foodservice industry vendor and is an example of the vertical ZWZ impact. As a GFA sponsor, FreshPoint is an active participant in bringing sustainable practices to their internal operations. FreshPoint is also spearheading efforts to create viable distribution channels for delivering local produce to the foodservice industry. The thread of consistency through all GFA projects is source reduction: taking action where operators purchase excess material or use unnecessary energy. Zero Waste Zones are the beginning and an exciting beginning! Affairs to Remember Gets a Divorce from Landfills! impressive garden in the back of the parking area. Check out these stats from the release, "Affairs to Remember was designated Atlanta's very first Zero Waste Zone Caterer by the Green Foodservice Alliance in May, 2009 - a program that has helped this off-premises caterer to reduce their on-campus landfill waste by over 83%. This number is shocking given that, in just one month, Affairs to Remember generated 8.5 tons of material that would normally have headed straight to our landfills. The Affairs to Remember team of catering and culinary staff embraced this designation and diverted around 14,238 pounds of recoverable material from our ever-expanding landfills just last month." Kudos to Affairs to Remember for taking the champion role in the catering industry for creating and implementing sustainable practices.